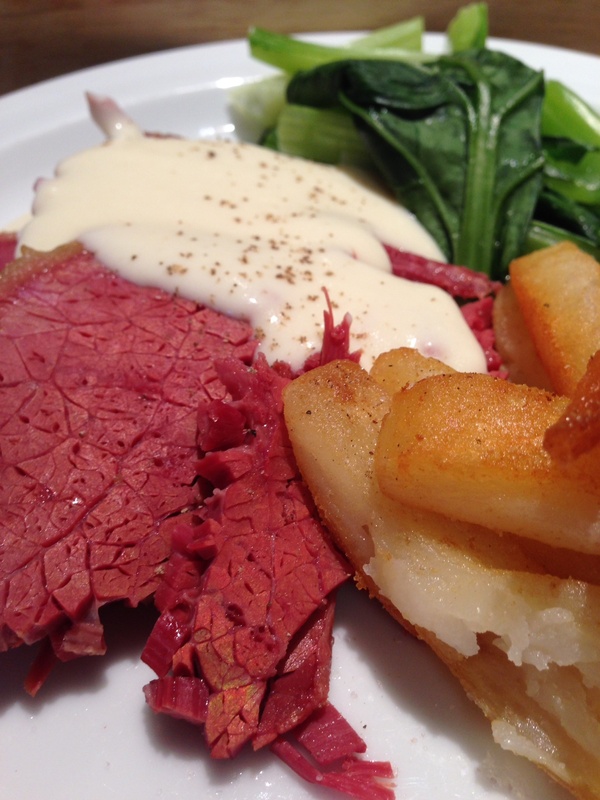 The Rains are ‘ere – And the slow cooker is out – Corned beef with mustard white sauce. It’s definitely Autumn here in Canberra. It’s been raining for two days, and it’s pretty morose, grey and miserable. Don’t get me wrong, the gardener in me is loving all this rain, my herbs and deck plants are going nuts and look as Green as Green Gables. The chickens are getting a massive protein kick from all the slugs, n snails n worms that are everywhere. I’m put out, though, because rain on my deck means wet muddy footprints across my white tiled kitchen floor. Tip to the wise – don’t buy a house with white carpet and tiling if you have children or a mechanic in the family. Big mistake. BIG mistake. The best thing about this cold, wet weather means the slow cooker comes out and takes pride of place permanently on the bench top. We love corned beef with all the trimmings in this house. I love, love, love the fact that I can spend 15 minutes in the morning throwing things into my slow cooker with abandon, then coming home to the divine smells of unctuous, melt in the mouth meaty meals, ready to calm the screaming hungry hoards. Thing of dreams really. 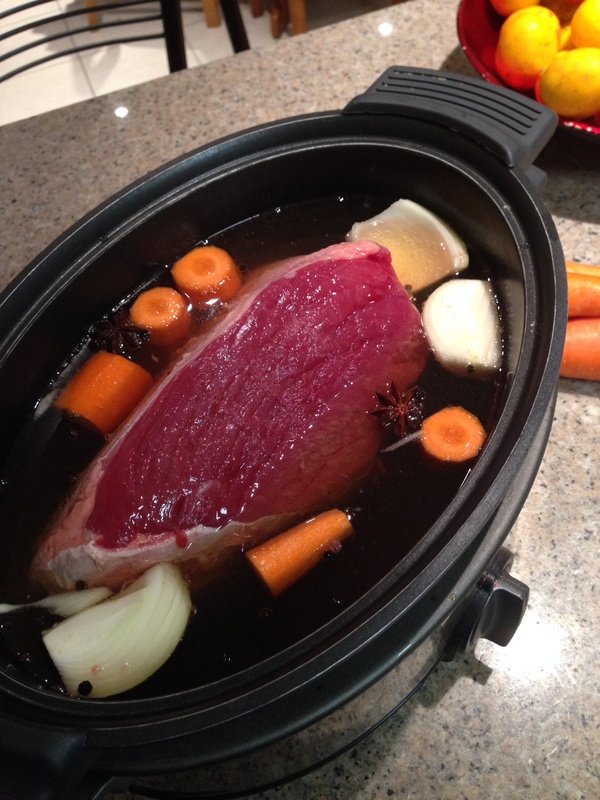 I’m a member of a Facebook Slow Cooker group and I swear there is absolutely nothing you can’t cook in the slow cooker. Roasts, stews, soups, breads, lasagnes – the choice is endless and mindboggling. I bought myself a Sear n Serve Breville slow cooker and think it’s one of the best things ever invented. It may very well surpass my love of my potato ricer. But, the two are a match made in food heaven, quite frankly. You can lift the non stick insert out and sear and brown off the meat and reduce sauces on the stovetop, it can go in the oven, and on gas cooktops, so much better than the older ceramic style slow cookers in my opinion. 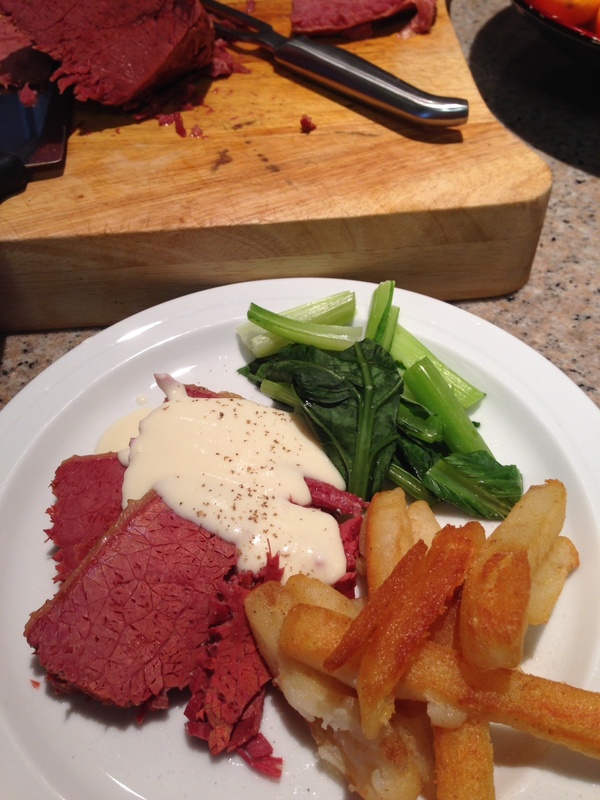 Last night we had corned beef with a mustard white sauce, greens and chips. I was not in the mood to go the whole hog and do mashed potatoes, and besides, who doesn’t love a hot bowl of crunchy salty chippies on a cold, rainy Canberra night? For anyone with kids, you’ll know just how many different brands of frozen chips you’ve tried over the years to get that one chip that’s crispy on the outside and soft and fluffy on the inside. Well, after years of research we had found frozen chip Nirvana at Aldi’s 👍 Then they stopped stocking them 👎 We tried Woolies, chips, Coles chips, even IGA’s chips, but nothing compared to the original. Then we went back to Aldi’s and Eureka! We found our new favourite frozen chip brand. And cheaper than the rest too, which is a boon. We now only buy these chips, and they’re guaranteed to be perfect every time. But you have to put oil with them, just a couple of tablespoons is all that’s needed, toss them around and Voila, perfect chippies. I chop and change with my recipes for corned beef, and sometimes find it’s not my cooking but the brand of beef that makes the difference. Trial and error really, last nights’ was good, it was a Woolies brand. Do not get the low salt version and think it’ll taste the same. They simply do not. I’m not a fan. I don’t bother to soak mine either, but I do rinse all the slimey stuff off. This is the recipe I used last night, and it was really yum! Just a hint of spice from the star anise and ginger ale, turned it from usual to unusually good. Put it all into the slow cooker. Switch it on low. Cook for at least 8 – 9 hours. 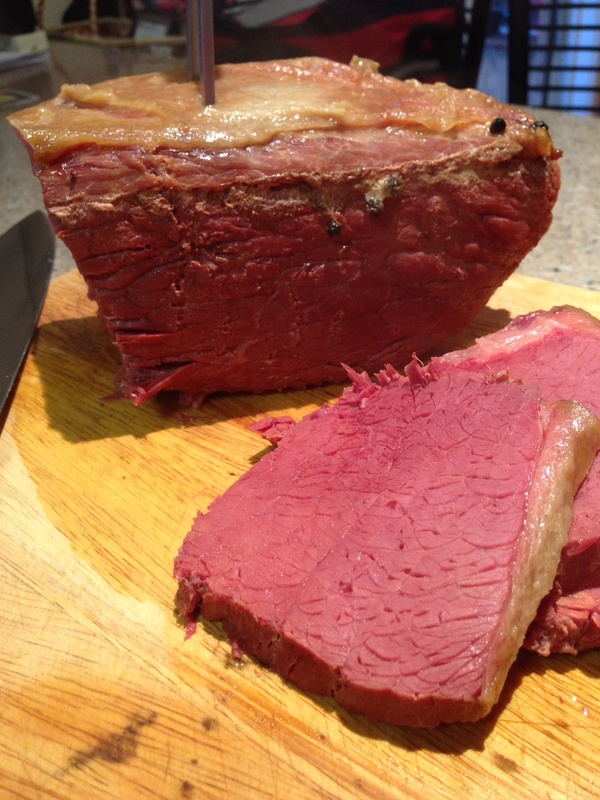 I like my corned beef just on the edge of crumbling when I slice it. Cook it for less if you like yours a little firmer. 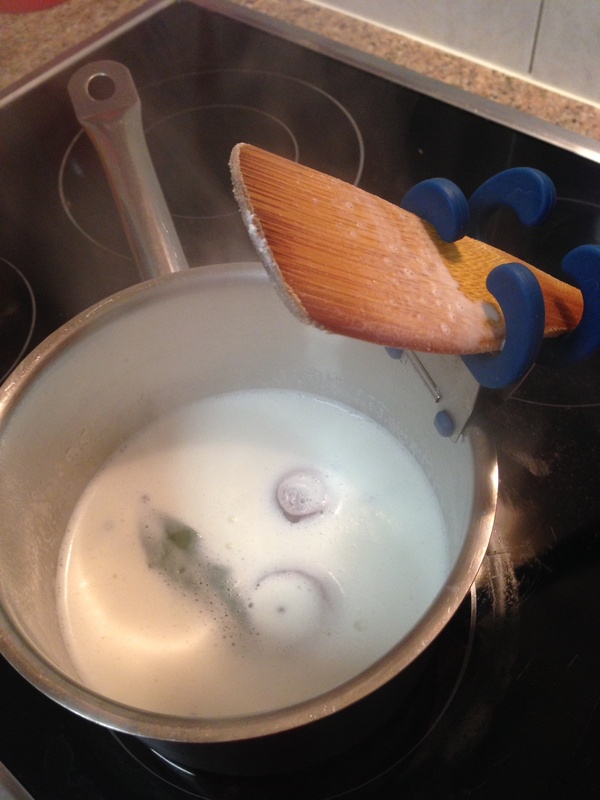 Put the milk in a saucepan (or you can do this in the microwave) with the onion, peppercorns, bay leaf and bring to a soft boil. Turn the heat off and allow to infuse while you make the roux. Melt the butter in a saucepan, add the flour and mustard powder and cook for about 5 minutes to cook out the flour. 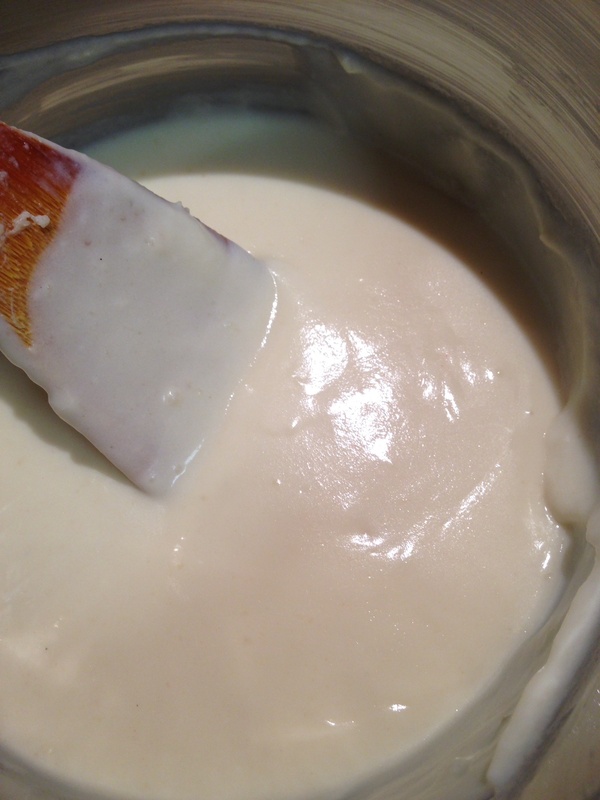 Take the pan off the heat, I usually put a strainer over the saucepan and pour the infused milk straight into the roux and start whisking immediately. It shouldn’t go lumpy if the milk is still hot, cold milk makes lumps. Put the pan back on the heat and stir until it’s thickened to how you like it. Season it really well with salt and white pepper if you have it. It will get thicker once it cools a little. It will also form a skin, but I just stir that back in. Steam some greens, cook your chips, serve it all up with a big ladleful of white sauce. Dig in. I’ve been asked to provide some simple, tasty recipes for mid-week dinners, for those who are like me, with little time, but a few big appetites! 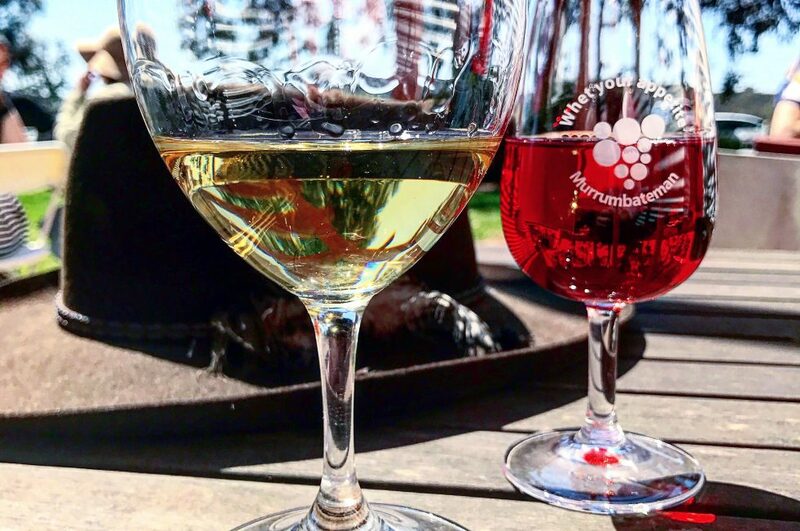 What do you fancy midweek, especially in winter? Previous Post Twice cooked Chinese chicken – Little bit of this, little bit of that, a whole lotta of taste.